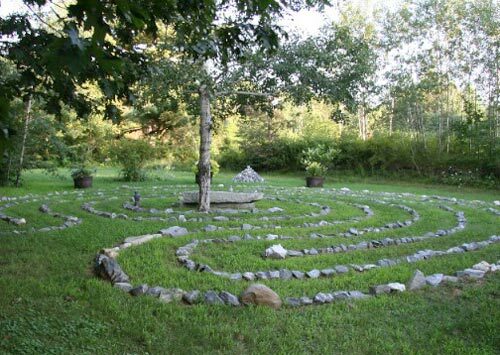 We invite you to walk the White Pine Healing Labyrinth for relaxation, stress reduction and healing. In a world of conflict, the labyrinth offers peace. In a world of over-stimulation, the labyrinth offers solitude. In a world of anxiety, the labyrinth offers calmness. Walk it before or after an appointment, or come anytime. The Labyrinth is open to the public. The Healing Labyrinth at White Pine Holistic Medicine is of a very ancient design called the Baltic. It is a variant which appeared in prehistory around the shores of the Baltic Sea in present-day Germany, Poland and Scandinavia. 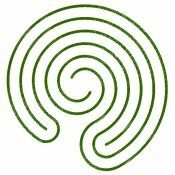 Incorporating the even-older double spiral symbol, this labyrinth can be walked in several different ways, making it a very flexible meditation tool. Entering to the left and making his/her way to the center, a walker can exit via the shorter double-spiral arm. By bearing to the right on the shorter arm, the labyrinth can be walked again and again. Or the labyrinth can be walked in the more traditional way, retracing the entry path back out. 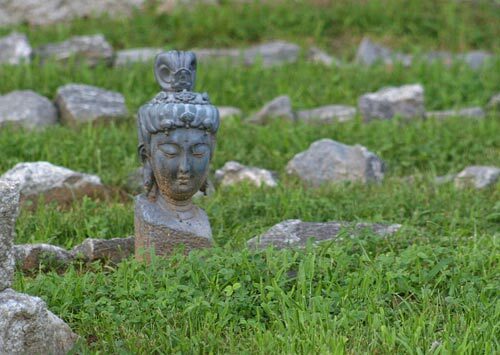 For more information about different labyrinth types, you can visit Whispering Grove and Wikipedia. 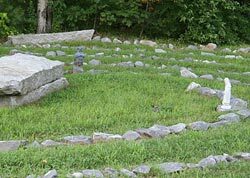 The White Pine Healing Labyrinth is located adjacent to the office of White Pine Holistic Medicine, behind the large barn at the end of the driveway. Go through the white archway to the left of the barn to find the labyrinth in the field behind. For driving directions, please visit the directions page for our office. The First Parish Church Labyrinth in Brunswick, Maine is an indoor labyrinth that is open to the public several days each year between Oct. & April. Check their program for schedule and times. labyrinthlocator.com has a worldwide index of labyrinths. 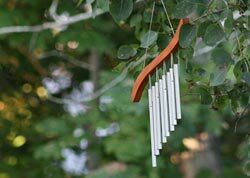 This is a listing of nearby labyrinths in Brunswick, Maine. You can also do a a basic search right on their homepage and a more advanced search via their locate a labyrinth page . Q: Is your labyrinth open to the public? Yes, the labyrinth is open to the public. Q: When can we visit your labyrinth? Since winters can bring lots of snow to Maine, access is seasonal. The labyrinth is generally accessible between mid to late April till the end of November into early December. It was built in the fall of 2005. 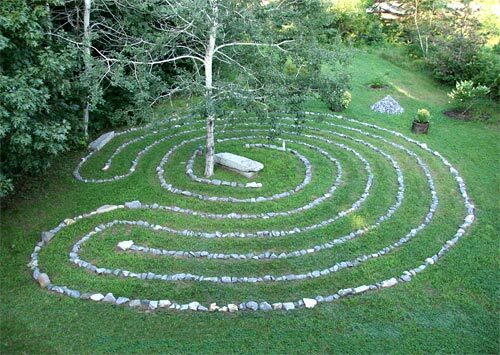 Our labyrinth was designed by the Whispering Grove Labyrinth Society and built together with David-Anthony Curtis.